There is nothing I enjoy more on a cold gray day than a cup of hot tea. Especially if I made it using loose-leaf tea. Scooping those delicate leaves into a diffuser and then watching as their beautiful color swirls into the steaming water is something I never grow tired of. 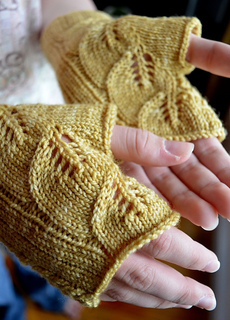 Graceful leaves adorn the insides and outsides of these gloves, stemming from a line of eyeleted mock-cables. 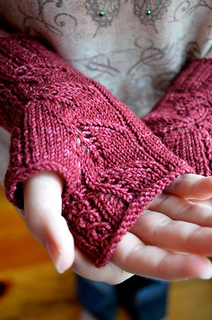 Another eyeleted mock-cable accents the outer wrist, lending balance to the design. 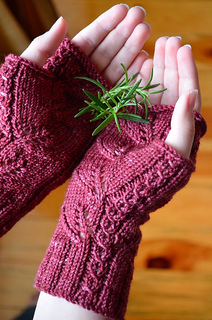 The ribs between the two mock-cables gives the cuff plenty of stretch, and the gusseted thumb is comfortable and easy to knit.